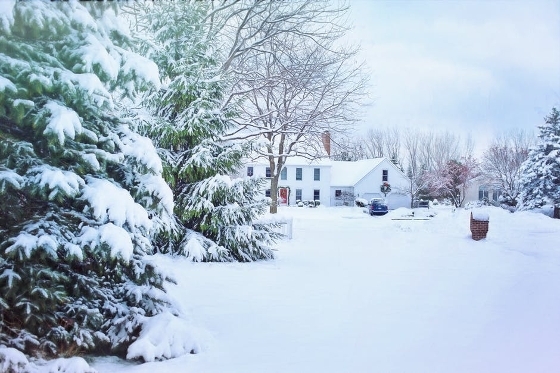 Prepare Your Home For Winter - It's Not Too Late! The temperatures have dropped significantly in the last week but it's not too late to take some steps to prepare your home for the colder temperatures on the way. One of the biggest hazards for winter in terms of the potential damage to your home, is the risk of pipes bursting from exposure to freezing temperatures. Identify problem pipes in your house that are prone to freezing - areas where it is not heated and where pipes run through crawlspaces, basements or garages. Use insulation sleeves on the pipes or heat tape in cases of extreme cold. Another option is to keep a slow trickle of water flowing through faucets connected to pipes that run through unheated or unprotected spaces. Be sure that everyone in the household knows how to turn off the water at the source should a pipe burst. Unfortunately fires are also too common in the winter. Be sure to have your chimney inspected and cleaned by a professional, have heating systems checked, replace furnace filters and install a carbon monoxide monitor if you don't already have one. Be sure to test your smoke alarms and carbon monoxide monitors and replace batteries. To improve energy efficiency, seal air leaks. It is easy to add or replace weather stripping around doors and windows as well as repair caulking around windows to reduce drafts. There are many different types of programmable thermostats to choose from as well as wifi thermostats so that you can program, adjust or monitor your home's temperature even when you are not there. Ice dams on roofs occur when heat collects in the attic and warms the roof, except the eaves. Snow melts on the warm roof and then refreezes on the eaves. Ice accumulates along the eaves forming a dam. The meltwater from the warm roof backs up behind it and can flow under the shingles and into the house. There are quick ways to prevent ice dams as well as permanent solutions. One quick fix includes installing heated cables with clips along the roof's edge to equalize your roof's temperature from the outside. In order to get rid of ice dams for good, the entire roof must be the same temperature as the eaves and this is achieved by increasing ventilation, adding insulation and sealing off every possible air leak that might warm the underside of the roof. One final safety tip is to remove tree branches that may get weighed down with snow or ice and fall on your house or your neighbour's house and potentially cause damage. The cold temperatures may be here but simple fixes can keep your home warm, less drafty and safe from potential winter hazards.